The vertical planks of this simple door are held together on the back side by several battens, or horizontal boards. Either this door's owner hates the mail carrier and is trying to punish him or her with the inconvenient location of the mail slot, or this is a ledged-and-braced door. A ledged-and-braced batten door has diagonal bracing to help support the door and to keep it from skewing. 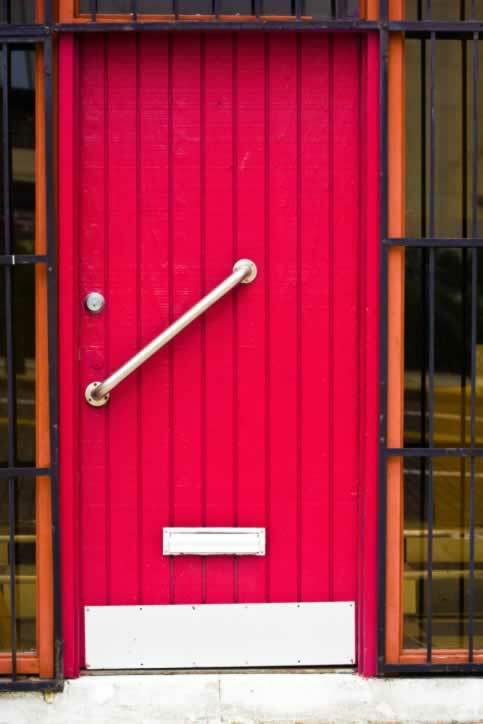 If this door had such diagonal bracing and a batten in the middle of the door, the installation of the stainless steel mail slot would be made more difficult. The peculiar choice of the long, stainless steel bar as door hardware and the location also supports the theory of diagonal bracing, as a batten would provide more structural support for the constant pulling on the handle. In the correct places on the door are matching stainless steel kick plate and a dead bolt lock. The planks have been painted with a glossy raspberry-pink enamel.